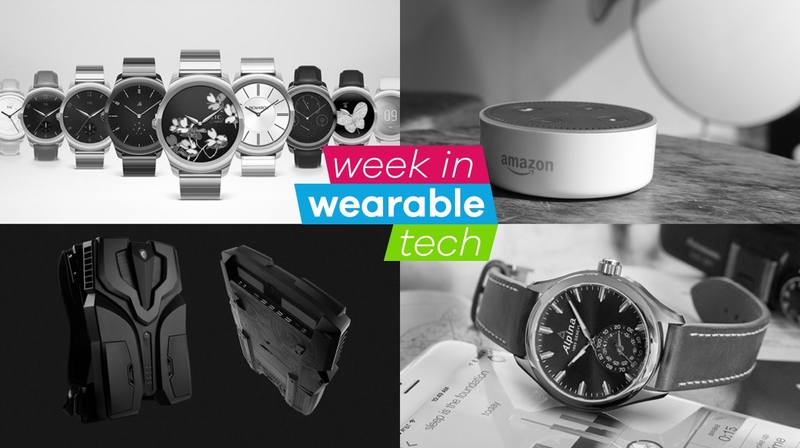 Okay, so there was no mega tech show this week, nor a high-profile Apple keynote, but that doesn't mean that the wearable tech news agenda ground to a halt. Amazon has updated the Echo Dot and revealed that it, along with the Echo speaker, is finally coming to the UK. The first-gen Echo Dot was launched in the US back in March and with the new Dot, you're essentially getting a slimmer design, volume buttons and a more powerful processor to help make Alexa smarter... and it's cheaper too. Check out our nifty guide to the best Amazon Alexa skills to get started. This new version of MSI's backpack, made specifically for the HTC Vive, has a slightly different design to the one we'd seen prior, and comes with a new name: MSI VR One. It weighs 3.6kg and provides about an hour and a half's VR fun, powered by a Nvidia GTX 1 graphics card. HP and Alienware are among a handful of others to also announce similar products, but the VR backpack market is hardly a thriving one. Yet. Swimsense Live has been updated with more accurate tracking systems, new swim-specific data and Bluetooth syncing for real-time results all behind a redesigned chassis. It costs $179.99 and is on sale now. Of course, the Apple Watch Series 2 also now boasts serious swim credentials. Have a look at our pick of the best swim trackers. According to a new IDC report, 9.54 million wearables were shipped between April and June this year in China - up 81% on the same period in 2015. IDC's estimate for global wearable tech sales in 2016 is 101.9 million. So if China keeps up the way it's going, it could end up accounting for 20 or even 30% of total wearable tech sales. There's no doubt smart analogue watches are proving popular and the latest entry, the newest Swiss Horological Smartwatch from Alpina is no exception. The new Alpina is certainly a looker and this has been the Horological Smartwatches' main selling point since the Swiss-Silicon Valley Open Platform launched with Alpina, Mondaine and Frederique Constant last year.